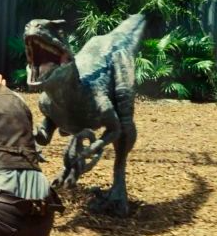 Blue (Serial Number: B-420 as per Jurassic World: The Game) is one of the four Velociraptors that made up Owen Grady’s raptor pack. 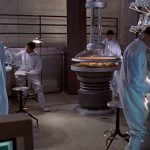 The Velociraptors were contained in a special behavioral facility on Isla Nublar, where Owen trained and researched the animals. Blue is the eldest member of the raptor pack and is considered to be larger, smarter and more cunning then the rest. She is described as insisting on eating first, although Owen Grady follows the procedure of feeding her last so as to reinforce his dominance as leader of the pack. Blue gained her distinctive striped pattern due to DNA infusion from the Black-Throated African Monitor Lizard. Leading up to the major events of the incident occurred Blue and her pack mates, Delta, and Charlie, attempted to strike Leon, a newly hired Jurassic World employee, after he accidentally fell inside when he tried to capture a pig that managed escaped its holding pen. Blue and her pack assisted Owen and Vic Hoskin’s InGen team track down the Indominus rex. During the hunt, once the Raptor Squad had picked up the scent of the Indominus, oddly enough the humans learnt that the hybrid animal was part raptor allowing it to communicate with the squad. It took Owen’s place as the alpha, commanding Blue and her pack mates turned against the humans. Her pack attacked many of the humans that followed them, including Barry who took refuge in a log just before Blue jumped onto it and started to try and get at him. Barry yelled “Blue” causing her to stop and look inside. Owen intervenes and whistles to get Blue’s attention, stopping her from possibly resuming her attack on Barry. Blue and the rest for her pack later caught up with Owen, Claire, Zach and Gray in Main Street where the bond that was once shared with Owen was renewed after he removed the video camera from her head. 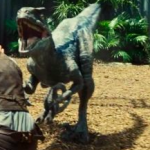 The Indominus rex arrived, where Blue and the remaining members of the pack challenged the Indominus, resulting in the seemingly killing of Blue along with Delta and Echo. 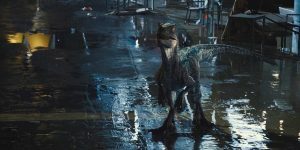 However, she seemingly was not killed and just as the Tyrannosaur of Nublar was about to be defeated at the jaws of the Hybrid, Blue charged into the battle, distracting it long enough for the Tyrannosaur to gain her feet back and team up to take down the Indominus. Blue assisted Rexy in her fight against the hybrid pushing her closer to the lagoon, where when it was close enough the Mosasaurus lunged from her enclosure and grabbed the Indominus, dragging her to the depths of the Lagoon. After the fight, the Tyrannosaur and Blue looked at each other. There was a brief moment which could have resulted in the two animals engaging in conflict however the Tyrannosaur too injured to do anything, walked back towards the forest, seeing no need for a fight. Blue then turned towards Owen, a brief moment between the two as to what looked like a final goodbye, where then Blue ran up Main Street and seemingly into the wild.